Pundits will be picking over the results of this election for years and there are many reasons why things turned out as they did. For Labour though, in one respect, this election was lost in the aftermath of the last one. The opposition parties kept repeating the story of Blair and Brown spending with gay abandon and running up a massive debt. In the months after the 2010 election Labour never managed to nail that story. By the time they tried, it was too late. As Simon Wren-Lewis says, there wasn’t any evidence to support it. 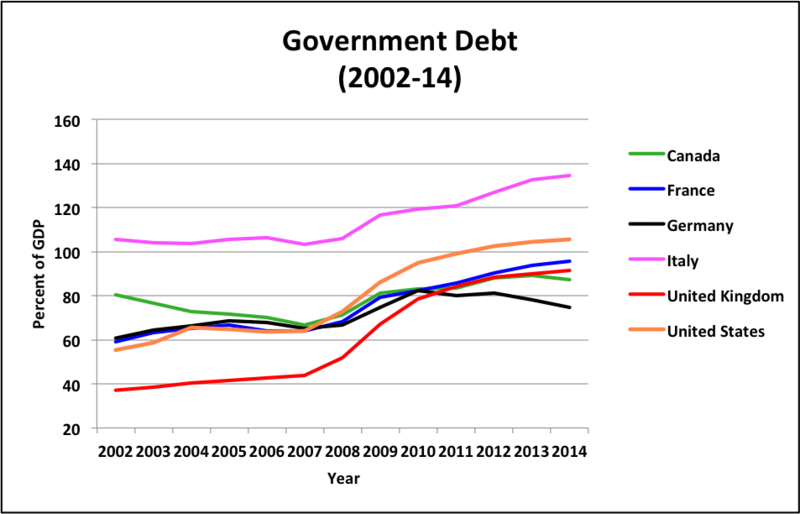 True, Labour ran a deficit in the last decade but that wasn’t what caused the big jump in the debt-to-GDP ratio. By the time of the recession, the deficit was falling and was almost yesterday’s news. 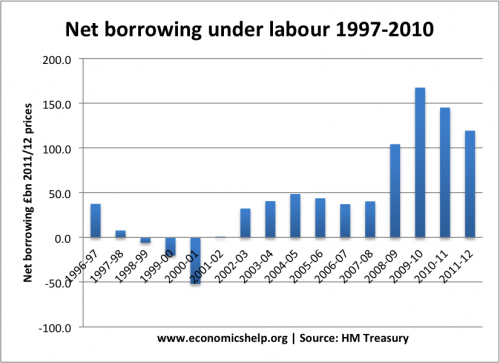 As this chart from Economics Help shows, the highest borrowing came in the year before the 2005 general election, yet the deficit was barely mentioned during the election campaign. This was because it wasn’t really seen as a big deal. People were asking for an improved NHS, more police and more teachers. You could argue that Gordon Brown should have funded this from taxes, rather than borrowing, especially during a period of growth. It was also true that most other advanced economies were reducing their deficits by the mid 2000s but they had more reason to do so because their debt was much higher. The UK had the lowest level of debt in the G7 before the recession. As the OBR pointed out in its detailed analysis of the public finances over the last decade, some of the deficit was simply due to the sort of poor forecasting that afflicts governments from time to time. This pattern of unexpected surpluses followed by unexpectedly large deficits was similar to that seen under the previous Conservative Government from 1987 to 1993. So, while it might have been better not to have funded so much spending with a deficit, at the time no-one thought it was a major problem. If spending really had been out of control, Michael Howard and David Cameron would have harangued Tony Blair and Gordon Brown at the despatch box every week, warning of the dire consequences and making as much political capital as they could. But they didn’t. The deficit and, as a consequence, the debt only shot up with the financial crisis. And it shot up everywhere. The reason UK debt rose more quickly than that of other countries is because its tax revenues fell more sharply, largely due to its dependence on finance, the very industry that had caused the crash. If this was a Brown Debt, it must also have been a Bush Debt, a Sarkozy Debt and a Merkel Debt because most countries found themselves with a similar problem. 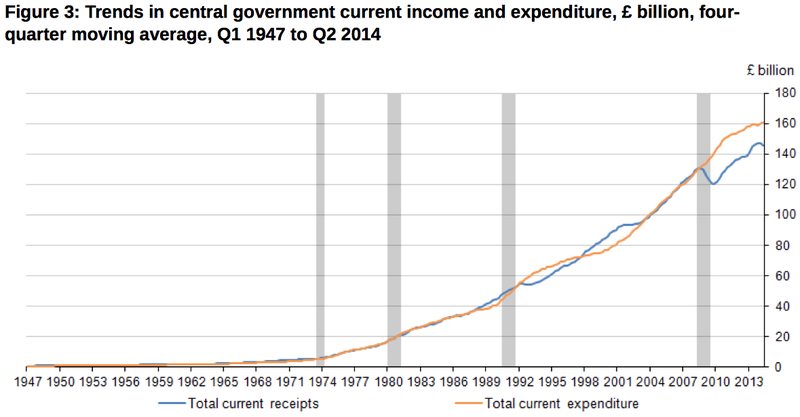 It was at this point that the government’s day-to-day spending came adrift from its tax revenues. It’s useful to look at this both in cash terms and as a percentage of GDP. 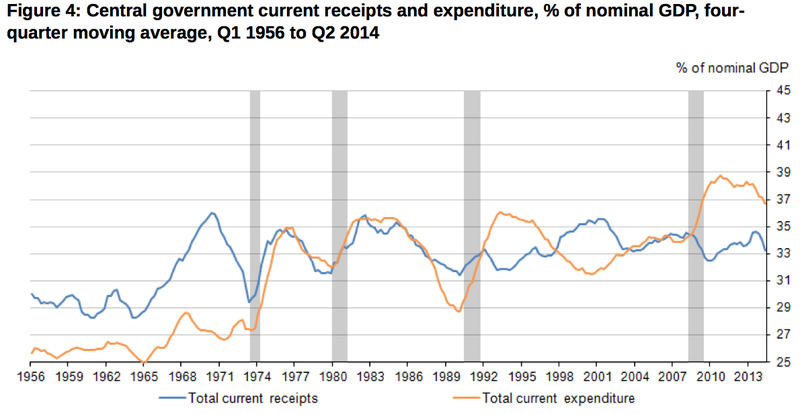 Spending continued to rise, as is to be expected in a recession, but tax revenues fell. The fall is less pronounced on the 2nd chart because GDP was also falling but the first chart shows the big gap opening up between spending and receipts 2008. 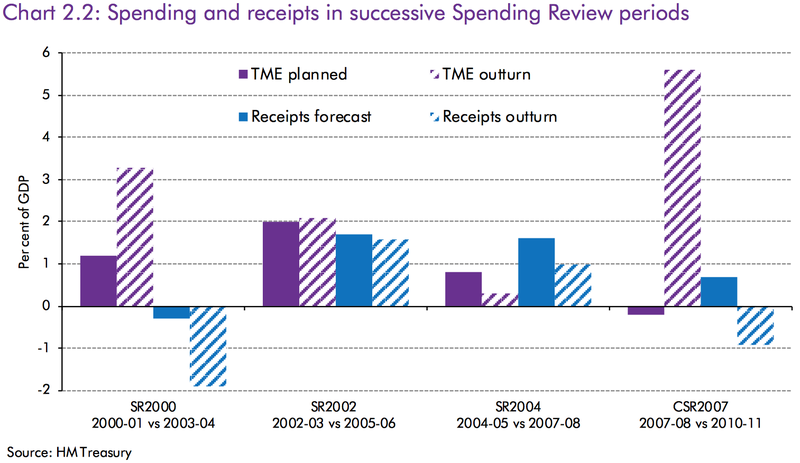 One could argue that the Labour government should have curbed spending in 2007 as a downturn was inevitable at some point. The OECD did give a nudge in that direction in one of its reports. But very few people saw the recession coming, let alone the extent of it. In March 2008, about half way between the collapse of Northern Rock and the demise of Lehman Brothers, the great and good of the economics world were forecasting continuing growth, albeit slightly slower than in the earlier part of the decade. No-one came close to predicting what really happened. The Conservatives certainly weren’t sounding the alarm. In late 2007, George Osborne was still promising to increase public spending. It was over a year later, after Lehman had crashed and it was clear the economy was contracting, that the Conservatives abandoned their policy of matching labour spending plans and started warning about a ‘borrowing bombshell‘. It was canny politics. In the mid 2000s, the Conservatives knew that public spending was popular which is why they agreed to match Labour’s plans. 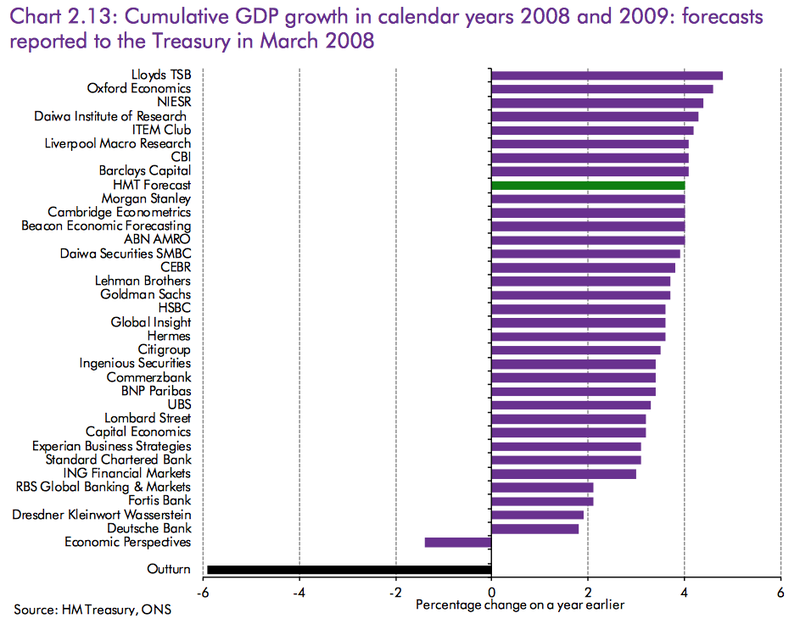 The recession and the associated jump in the public deficit, gave them something with which to beat Labour. Link this rise in debt to earlier spending and a generalised charge of profligacy and they could make the effects of a global catastrophe look like incompetence. There was just enough in the way of continued deficits (albeit low ones by later standards) and the odd comment from the IFS or OECD to give a plausible sounding back story, even if it was one that the Conservatives had failed to notice at the time. It worked. Labour lost the election though not by enough to give the Conservatives a majority. But while Labour went into a bout of introspection, the Tories kept hammering home the message of Labour spending, debt and fiscal incompetence. Labour, pre-occupied with its leadership election, failed to challenge the narrative and so it became part of the accepted version of the financial crisis. Liam Byrne’s ‘no money left‘ note might have been a joke but it was incredibly naive and only helped his opponents. The image of an empty treasury was powerful and enduring. It is understandable that the Conservatives, under George Osborne, the guileful chancellor, and Lynton Crosby, his election guru, should make this their mantra. What is less understandable is that Labour, under Ed Miliband and Ed Balls, his shadow chancellor, has been hesitant to rebut this charge. They have worked harder to distance themselves from New Labour than to defend its record. This hands the Tories a needless advantage. In one of the TV debates, when Ed Miliband tried to explain why the public debt wasn’t due to Labour’s overspending, no-one was listening. It was too late by then. Too many people had accepted the government’s version of events and saw any denial as a lie. Since then, a number of economists have backed Miliband up on the question of debt and spending. But they have been doing that since 2010. Lots of articles were written about this but it really didn’t matter what the economics said because Labour had already lost the politics. That Labour went on a spending spree and ran up a massive debt bill is one of those things that “everybody knows”. Labour needs to get on with a leadership election and not, as in 2010, led the Tories set the agenda while we bicker. He’s right. Whatever the economics of the Labour spending and debt story, the Conservatives handled the politics deftly and a stunned Labour Party let them get away with it. If Gordon Brown had not run deficits in the early and mid 2000s, the public debt might now be a little less, but not much. Most of the sharp increase debt came about as a result of the recession. But politics is just as important as economics and the Conservatives won the politics hands down before Labour had realised what was going on. A lot of people are still convinced that the Blair and Brown governments were responsible for the rapid increase in debt in the late 2000s. It will take a long time for Labour to persuade them otherwise. If it ever does. Not only did Labour lose the argument on fiscal policy five years ago, they failed to set the consequent agenda in respect of falling productivity, weak capital investment (in industry), and the worsening balance of payments. Instead we had the nonsense of the “budget responsibility lock” and the inanities of the pledge-stone. It’s as if they were terrified of treating the electorate as adults. The problem was that Gordon Brown ramped up spending and taxes, this massaged the figures but the strutural deficit was over 5% before the recession it was just hidden by tax receipts. The problem was that in a recession tax recipets fall and spending increases, it was a particularly bad recession that we had nothing in the tank for! Gordon Brown thought he could get away with it because run his own words he had “eliminated boom & bust” to absolve him of responsibility is ludicrous! I wonder if Liam Byrne ever regrets that note? It’s certainly much more memorable to most people than any number of graphs and discussions about cyclical surpluses and deficits. I think you miss the problem with the pre-crisis spending by Labour. True, there was no real objection at the time to increasing funding for the various public services, but we were then being told that the money was there to be spent because of the excellence of GB’s management of the economy. When it became clear that not returning to boom and bust was a delusion/ con, having run a deficit during the 2001 to 2007 period looked irresponsible and built on a lie. I would not worry about the past. The new gov is stuck between a housing bubble, decreased ownership ratio, EU referendum and higher rates from the Fed. If anybody thinks that there wont be a crash in the next 5 years, then good luck. How much more QE can BoE do before the £ tanks? When the Fed does the lift off, then BoE will be stuck at 0.5% for ever. Unless they allow house prices to drop, they have no chance of responding to the Fed. 1. “People were asking for an improved NHS, more police and more teachers. You could argue that Gordon Brown should have funded this from taxes, rather than borrowing, especially during a period of growth.” This gets to it. Demand for improved public services will be near infinite, because they are oft touted as being “free”. Gordon’s job was to point out they weren’t and to show some economic leadership and restraint. He didn’t. Some might say he was creating a client state, or more simply, buying votes. 2. Running any machine at full capacity gives you no leeway for shocks. Maxing out spending gave us no room for a shock when it came. Shocks always happen – whether oil based as in the 70s, self-inflicted as in the ERM debacle of the 90s, or banker-originated as in 2008. Government’s job is to be aware shocks happen, and to have something in reserve to cushion the blow. 3. Labour has an unfortunate habit of leaving office with the economy in a shambles. in ’79 we had Dennis Healey’s IMF bail-out loans to sort out, 25% inflation and had just gone through a Winter of Discontent. We all know about 2008. Such a habit is one they need to lose. 5. Appearing to be the “Benefits” party. 6. Never talking about how to generate wealth, only how to confiscate and spend it. Hopefully Labour will take a little time out, and will come back with a much stronger, newer team. It’s vital we have strong competition in politics, none more so than a vibrant opposition. I sincerely wish them luck with that. I love how tories such as most of the commentators above blame National debt on a Labour Government rather than a Capitalist crisis. This is what happened in 1931. Poor Gordon Brown, he and Bush saved the system but get no love from those who believe in it. My criticism of Brown, Blair, Bush and other leaders would be that they all failed to monitor or regulate the gearing of the Financial system. Letting finance rip has always led to a crash eventually. But getting into bed with Mammon is a temptation politicians seem unable to resist. Sound analysis here on how Labour lost the economic argument about their fiscal record in government. The only thing I would add to this would be the Labour party’s position on austerity which also played into the Conservatives hands.